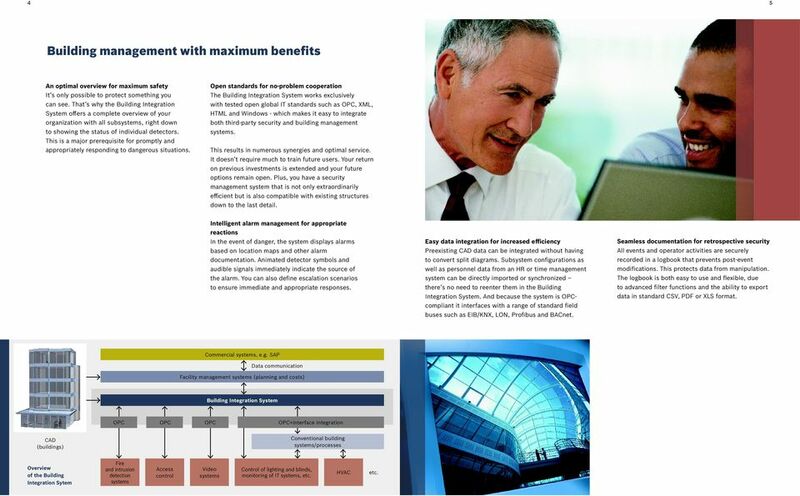 3 4 Building management with maximum benefits An optimal overview for maximum safety It s only possible to protect something you can see. That s why the Building Integration System offers a complete overview of your organization with all subsystems, right down to showing the status of individual detectors. This is a major prerequisite for promptly and appropriately responding to dangerous situations. 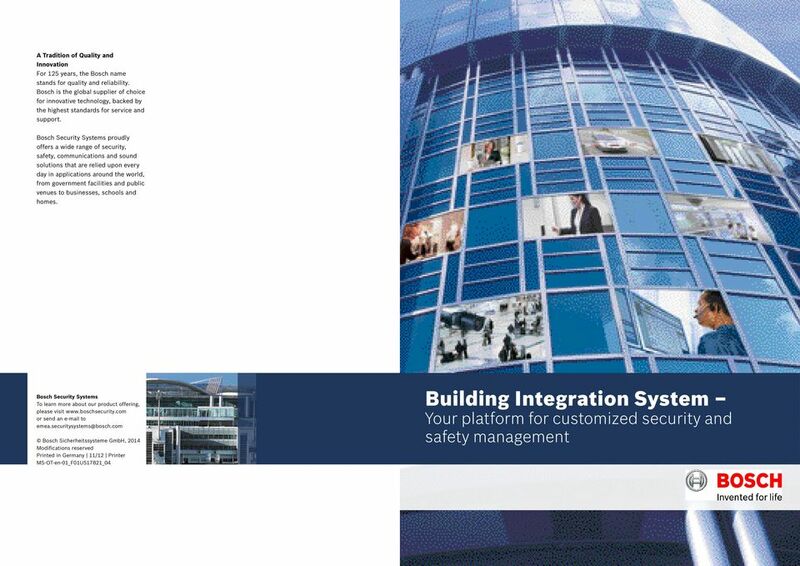 Open standards for no-problem cooperation The Building Integration System works exclusively with tested open global IT standards such as OPC, XML, HTML and Windows - which makes it easy to integrate both third-party security and building management systems. This results in numerous synergies and optimal service. It doesn t require much to train future users. Your return on previous investments is extended and your future options remain open. Plus, you have a security management system that is not only extraordinarily efficient but is also compatible with existing structures down to the last detail. Intelligent alarm management for appropriate reactions In the event of danger, the system displays alarms based on location maps and other alarm documentation. Animated detector symbols and audible signals immediately indicate the source of the alarm. You can also define escalation scenarios to ensure immediate and appropriate responses. Easy data integration for increased efficiency Preexisting CAD data can be integrated without having to convert split diagrams. 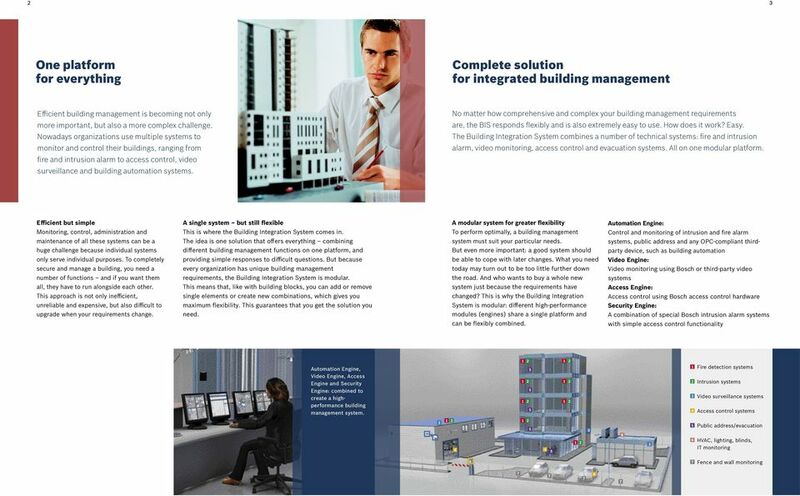 Subsystem configurations as well as personnel data from an HR or time management system can be directly imported or synchronized there s no need to reenter them in the Building Integration System. And because the system is OPCcompliant it interfaces with a range of standard field buses such as EIB/KNX, LON, Profibus and BACnet. Seamless documentation for retrospective security All events and operator activities are securely recorded in a logbook that prevents post-event modifications. This protects data from manipulation. The logbook is both easy to use and flexible, due to advanced filter functions and the ability to export data in standard CSV, PDF or XLS format. Commercial systems, e.g. SAP Data communication Facility management systems (planning and costs) Building Integration System OPC OPC OPC OPC+interface integration CAD (buildings) Conventional building systems/processes Overview of the Building Integration Sytem Fire and intrusion detection systems Access control Video systems Control of lighting and blinds, monitoring of IT systems, etc. HVAC etc. 4 6 The Automation Engine The Video Engine The efficient tool for comprehensive property security and monitoring of building automation systems The platform for perfect integration of video systems with access control and intrusion alarm systems Location maps and alarm documentation provide detailed information and action plans. And user-friendly operation translates into immediate and effective alarm management. Act faster, help sooner Nobody has eyes in the back of their heads. Nor is it necessary: that s what the Video Engine is for delivering a whole new dimension of performance as the central component for integrating and visualizing different video systems on one platform. Added value through integration The Video Engine is versatile and easy to combine with other security systems an advantage that generates numerous synergies: the Video Engine turns standard cameras into motion detectors with an alarm function. The larger the property, the more complex monitoring and control operations become. Simple building management systems are therefore When it really matters, every second counts. With the Automation Engine the operator knows immediately what to do because all the required information is provided in realtime. The corresponding alarm documentation is centrally stored and precisely tailored for its intended purpose, also including work cycles and location plans with animated alarm symbols. 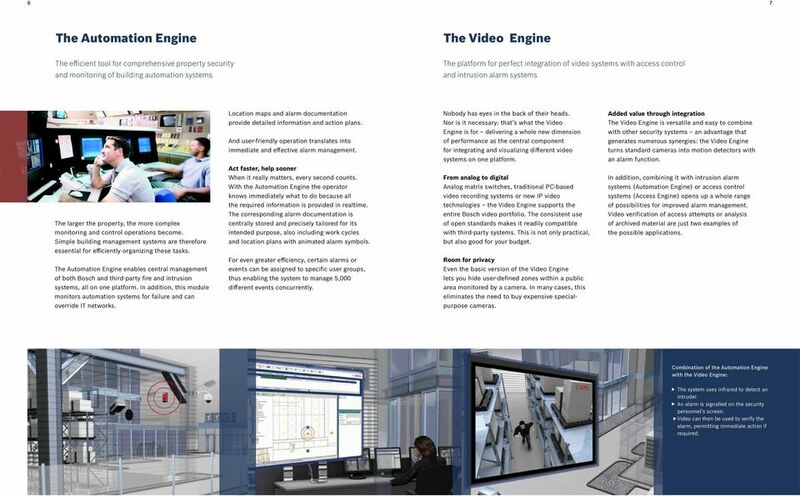 From analog to digital Analog matrix switches, traditional PC-based video recording systems or new IP video technologies the Video Engine supports the entire Bosch video portfolio. The consistent use of open standards makes it readily compatible with third-party systems. This is not only practical, but also good for your budget. In addition, combining it with intrusion alarm systems (Automation Engine) or access control systems (Access Engine) opens up a whole range of possibilities for improved alarm management. Video verification of access attempts or analysis of archived material are just two examples of the possible applications. essential for efficiently organizing these tasks. For even greater efficiency, certain alarms or Room for privacy The Automation Engine enables central management events can be assigned to specific user groups, Even the basic version of the Video Engine of both Bosch and third-party fire and intrusion thus enabling the system to manage,000 lets you hide user-defined zones within a public systems, all on one platform. In addition, this module different events concurrently. area monitored by a camera. In many cases, this monitors automation systems for failure and can eliminates the need to buy expensive special- override IT networks. purpose cameras. Combination of the Automation Engine with the Video Engine: The system uses infrared to detect an intruder. An alarm is signalled on the security personnel s screen. Video can then be used to verify the alarm, permitting immediate action if required. 5 8 9 The Access Engine The Security Engine Fully integrated access control management ranging from standard use to the most demanding individualized security solutions Security management for D6100/6600 alarm receivers and Dxxx/9xxx G intrusion panels It isn t appropriate to allow every employee to access all parts of a site, so an efficient access control system is indispensable in many buildings and organizations. The Access Engine has been specially developed to satisfy even the most demanding expectations. Its modularity lets you systematically build the right solution to meet all your access control needs and flexibly scale it up as they grow. User-friendly door management In addition to simple access control management, the Access Engine provides user-friendly control of doors and barriers with a clear overview on the user display that can be combined with video footage and intercom. Meeting the most demanding requests The Access Engine satisfies the most demanding security needs. 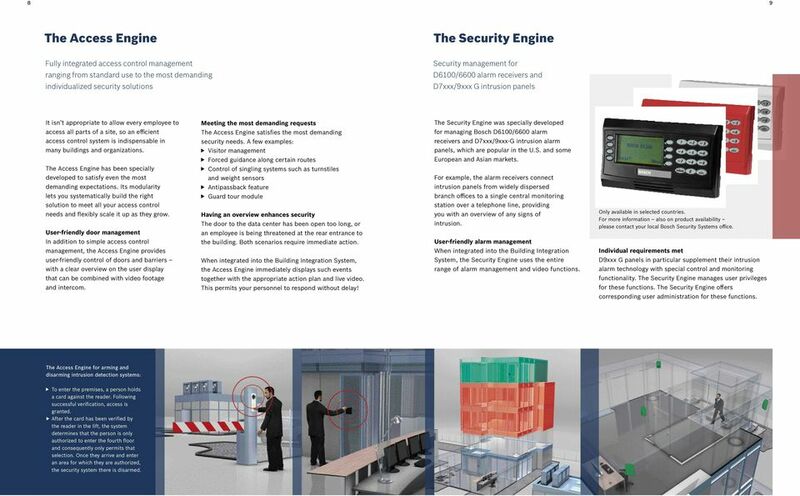 A few examples: Visitor management Forced guidance along certain routes Control of singling systems such as turnstiles and weight sensors Antipassback feature Guard tour module Having an overview enhances security The door to the data center has been open too long, or an employee is being threatened at the rear entrance to the building. Both scenarios require immediate action. 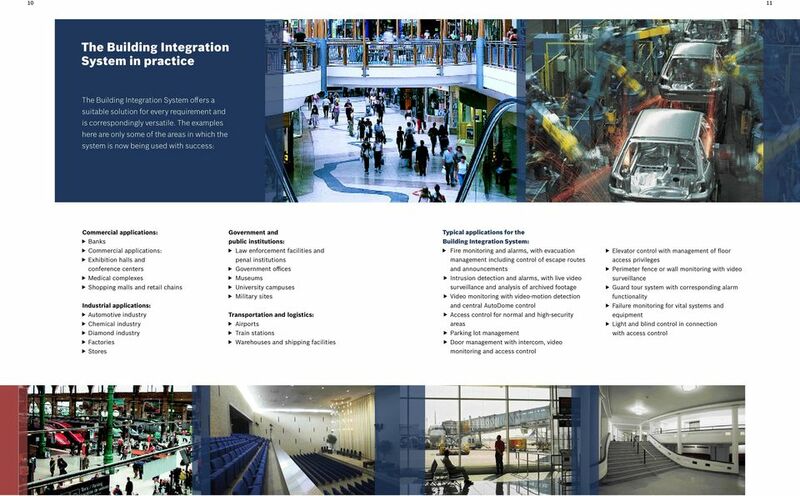 When integrated into the Building Integration System, the Access Engine immediately displays such events together with the appropriate action plan and live video. This permits your personnel to respond without delay! The Security Engine was specially developed for managing Bosch D6100/6600 alarm receivers and Dxxx/9xxx-G intrusion alarm panels, which are popular in the U.S. and some European and Asian markets. For example, the alarm receivers connect intrusion panels from widely dispersed branch offices to a single central monitoring station over a telephone line, providing you with an overview of any signs of intrusion. User-friendly alarm management When integrated into the Building Integration System, the Security Engine uses the entire range of alarm management and video functions. Only available in selected countries. For more information also on product availability please contact your local Bosch Security Systems office. Individual requirements met D9xxx G panels in particular supplement their intrusion alarm technology with special control and monitoring functionality. The Security Engine manages user privileges for these functions. The Security Engine offers corresponding user administration for these functions. The Access Engine for arming and disarming intrusion detection systems: To enter the premises, a person holds a card against the reader. Following successful verification, access is granted. After the card has been verified by the reader in the lift, the system determines that the person is only authorized to enter the fourth floor and consequently only permits that selection. Once they arrive and enter an area for which they are authorized, the security system there is disarmed. Your Go! to intelligent operational management FareGo Data CS The heart of our system architecture FareGo Data CS is the centre for data acquisition and administration for your fare collection system.